CANADIAN MANUFACTURER Bombardier has been forced to delay the launch of its joint venture with Russian Technologies state corporation, Rostec, amid deteriorating relations between Russia and the West. The $100 billion project, which included the establishment of a local production line for the Montreal-based firm’s Dash 8-Q400 turboprop, was originally planned to launch later this year. Canada has joined the US and the EU in imposing sanctions on Russia following its continuing support of Ukrainian separatists. Bombardier spokeswoman, Marianella de la Barrera, told Russia’s Vedomosti newspaper: “We are in negotiations with Rostec and hope to reach an agreement in 2014. But, given the context of what is going on right now, the project’s schedule may move to next year.” This followed news that Ilyushin may re-launch its Il-114 as part of a wider initiative by Russia to circumvent sanctions and reduce reliance on western-built aircraft. Production of the regional turboprop, which spanned just 20 examples, ceased in mid-2012. 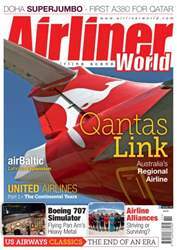 In the November issue of Airliner World, we profile Australia’s leading domestic airline and flag carrier subsidiary QantasLink. We also report on Latvian carrier airBaltic’s recent turnaround, welcome the arrival of Qatar Airways’ first Airbus A380 and examine whether global airline alliances are here to stay, or are they being put under pressure by new models of inter-carrier co-operation This issue celebrates some major landmarks; we join US Airways for the final flights of its iconic Boeing 737 Classics and we fly on the last Cyprus Airways service from London/Heathrow to Larnaca. Maintaining our historical theme, we have part 1 of the United/Continental Airlines story, and we fly Pam Am International Flight Academy’s full-motion Boeing 707 simulator, the last device of its kind in existence. The latest issue incorporates our comprehensive coverage of worldwide news, including Garuda Indonesia’s new services from London to Jakarta, the Boeing 737 MAX 200 launch and the official opening of Jet2.com’s multi-million pound training facility, plus all of our regular sections covering the latest commercial aircraft acquisitions, up-to-date accident reports and developments from the world of aviation training.